Good Year for the Susquehanna Flats? While last year’s Susquehanna Flats catch and release season surely tried the patience of even the most passionate flats aficionado, I look for better things to come as this spring approaches. Here’s my reasoning. This past fall saw a pretty good run of striped bass in Maryland’s mid and lower bay. 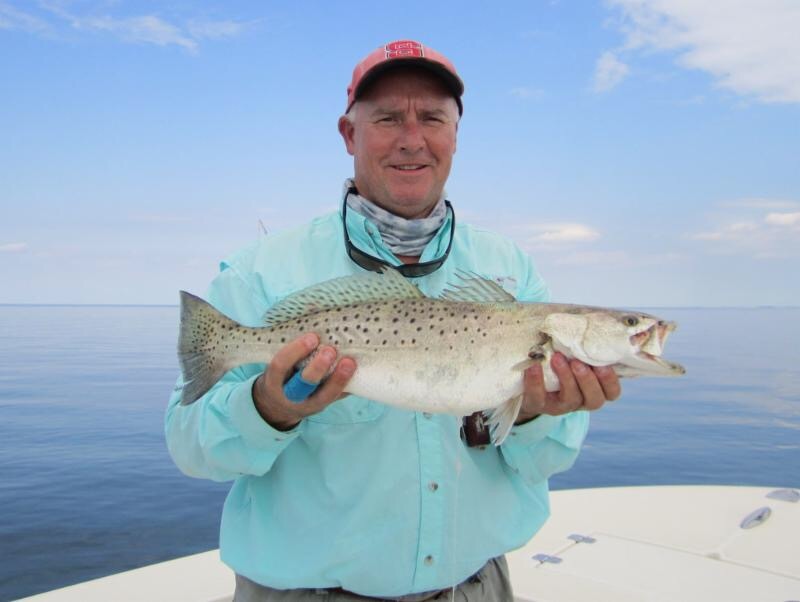 Beginning in mid-September, Tangier Sound and the bay proper along with the shallows surrounding the bay islands of Tangier, Smith, South Marsh, Holland, and so on, provided some of the best fly and light tackle angling for rockfish that we’ve experienced in several years. 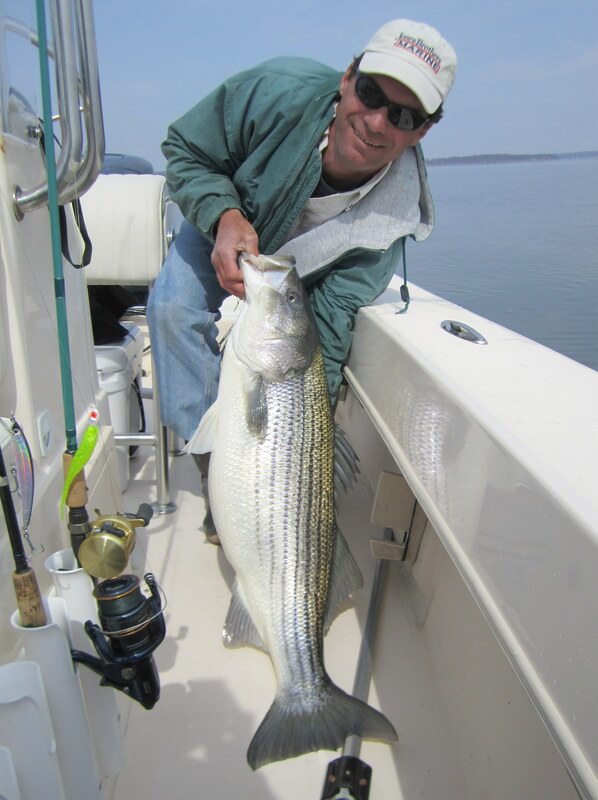 As the waters cooled, stripers gravitated towards the deeper channel edges of lower Tangier Sound, Smith Point and the mouth of the Potomac River. While the strong 2011 year class was well represented, many fish in the 28″ to 32″ category were also brought boat-side. These bigger males should begin returning to the spawning grounds in March, and I have to believe many of the 2011 fish, which should be approaching twenty inches or better, will tag along and fill in the gaps. There is always the chance of a true trophy of 40-inches, or more. All we need is some relatively clean water. Hopefully, most of the heavy snow melt gives the Susquehanna river basin a break for a change. To that end, I will once again be trailering my Jones Brothers to Havre de Grace for this very special spring fishery. I still have a few open dates remaining during the month of April, so if you would like to get in on this fun shallow water fishery please email or call me at your earliest convenience. I can be reached at kjosenhans@aol.com or 443-783-3271. Just a few short videos to see which format I like best! I decided to do a little fishing on the Pocomoke River this afternoon to see if the water temperature had risen above the 38 degree mark of my previous outing. The cold nights of late had me a little concerned. As if reading my mind, the gauge on my Lowrance HDS 7 quickly told me the water was a frigid 37 degrees, as I proceeded to back the Jones Brothers into the dark river water. Well, as they say, I’m here. And fishing doesn’t have to be catching to be fun. Something I tell my clients, on occasion. As the air temperature was fast approaching the sixty degree mark I pointed the bow south and took off in search of anything with fins. 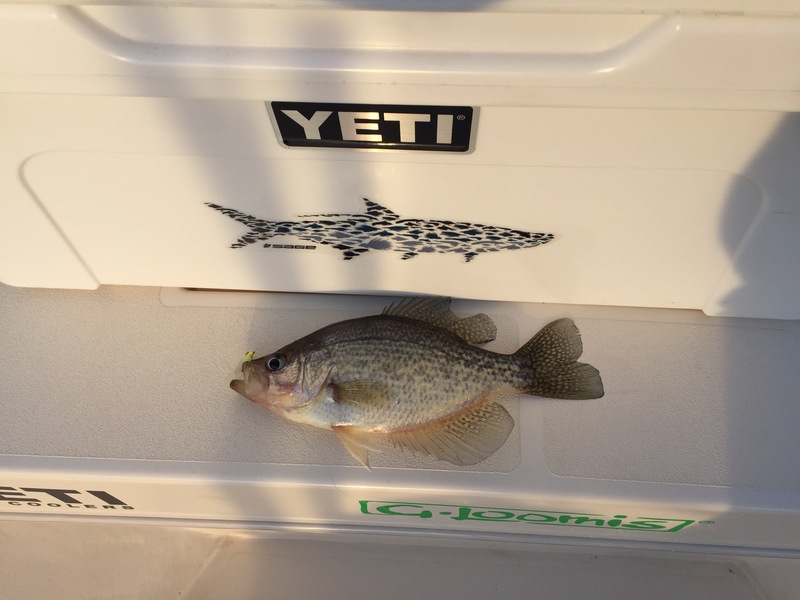 As I began to cast a 1/16 ounce crappie jig near the mouth of Nassawango Creek, it wasn’t long before a slight tug at the end of my G.Loomis ultralight signaled that something was indeed moving in the icy depths below. 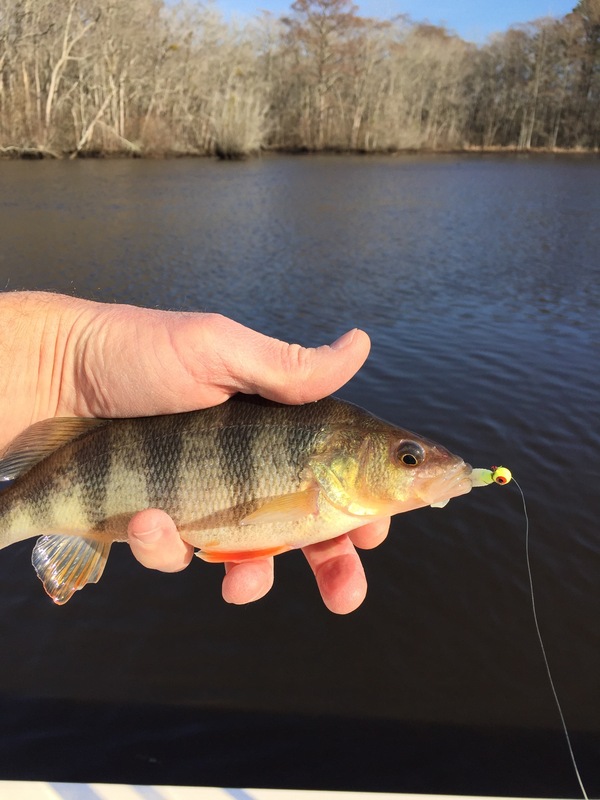 After a brief head-shake or two I was soon greeted by a brightly colored yellow perch of about ten inches. As I went to remove the hook from her upper lip the fish didn’t so much as raise a fin. Perhaps being pulled from water only five degrees from freezing had cooled this creature into a zombie like state, or maybe she was just enjoying the unseasonably warm weather as much as I was. Sorry Mrs. Perch but back you go.